Councilwoman Marti Emerald was nominated Friday to be the panel’s second-in-command by new council President Sherri Lightner. Emerald’s selection will be taken up by the City Council on Monday afternoon, along with a series of proposed committee assignments. Emerald would be the council president pro tem and would run meetings in Lightner’s absence. Lightner, who represents La Jolla and Carmel Valley, won her post Wednesday after two-year council President Todd Gloria failed to muster a majority. Only Gloria and Councilman David Alvarez voted against her. Emerald, who had a recent bout with breast cancer, would remain the chair of the Public Safety and Livable Neighborhoods Committee, which she has led for several years. Most other committee chairs would also remain the same, with Alvarez in charge of Environment, Mark Kersey leading Infrastructure, Scott Sherman managing Audit, and Lorie Zapf heading Smart Growth and Land Use. Myrtle Cole, who just won her first full term, would succeed Lightner as chair of Economic Development and Intergovernmental Relations if the slate is approved. Lightner plans to lead a newly formed committee to review the City Charter. Chris Cate, who was sworn in for his first term Wednesday, will not chair a committee. 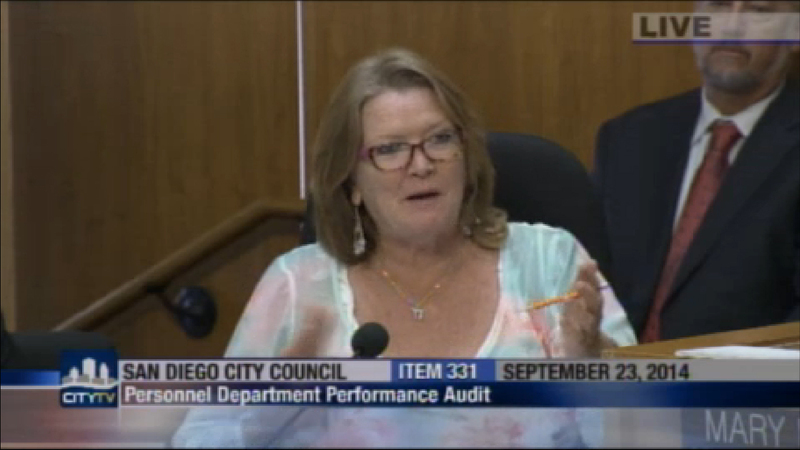 The former vice president of the San Diego Taxpayers Association also was not tapped for membership on the Budget Committee. Lightner also issued a slate of proposed assignments of City Council members to represent the city on various outside boards and agencies, including the San Diego Association of Governments, the Metropolitan Transit System and San Diego River Conservancy.